Recently, I've been trying to let my skin breathe a little and therefore I seem to have created a bit of a minimal, simple and quick makeup routine. When the weather gets colder my skin gets incredibly dry (and I seem to have a combination skin type anyway!) so using less products actually works to my favour. These products are just some of my current favourites, however, you can switch them out for your favourites if you wanted a quick routine yourself. Here is the contents of my November makeup bag! I start off with the Revlon Colourstay Concealer and focus this on any areas that need brightening. The creamy consistency of this product isn't harsh on dry and sensitive skin and works well to cover, conceal and brighten without being cakey. Following up with the Bourjois Healthy Balance Powder to magnify slightly and add a little bit of coverage (since it isn't translucent). I like this powder because it doesn't cling to any dry patches on the skin, which is great for this time of the year! The powder mattifies in a natural way so that it doesn't remove some of your skins natural glow. I add some colour back into my cheeks using the MaxFactor Creme Puff Blush in Gorgeous Berries. This has got to be my all-time favourite blusher. It is the most beautiful shade of berry and adds the perfect flush of colour to the apples of my cheeks. Next up, I use the L'Oreal Brow Artist Plumper to lightly define and hold my brows in place. The brown shade doesn't make them look too dark but just adds a little bit more definition. I am currently loving the Maybelline Lash Sensational Luscious Mascara as it just provides the perfect amount of volume and length to my lashes and doesn't transfer or crumble off throughout the day! I'm sure it's not only me that suffers with dry lips during the winter but I mostly wear lip balm during the day so I can keep them hydrated as much as possible. The First Aid Beauty Lip Therapy is a tinted lip balm and gives the best of both when it comes to moisture and a little bit of colour. I've also written a detailed post all about lip balms (if you love them as much as I do, please have a read here). What are your favourite minimal makeup products? I love autumn and winter fashion. I'm not sure why I love it more so than spring and summer but I just do! It may the element of layering and wearing cool coats - or perhaps just wearing more black (lets be real here). Either way, here is an autumnal going into winter appropriate outfit that I personally think is an outfit that can be worn to several occasions. It can be for work, an evening dinner or one for the weekend - you decide! These check print trousers are actually very versatile, believe it or not. I mentioned earlier that this outfit can be worn for a variety of occasions and these trousers are probably the reason why. They go with t shirts, jumpers, shirts, blouses, cardigans, coats... whatever you like I suppose! The cropped length is actually very flattering, even on someone short like me. The slightly tailored fit of the trousers makes it quite smart but depending on how it is styled, it can also be dressed down. I decided to tuck a simple black jumper into the trousers as it is rather nippy out now and since it didn't overpower the look to much (as the print on the trousers can be quite busy if paired with an equally busy top). I also think you can switch it up and wear a white top, shirt or jumper with this. It'll look veryyyyy nice too! 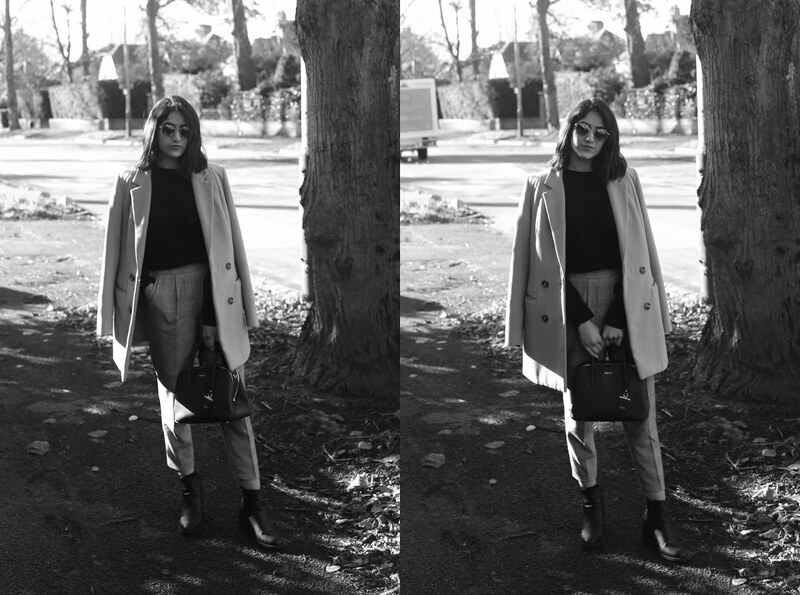 This monochrome outfit needed a little bit of colour and since I wasn't feeling too daring on this particular day, I stuck to wearing a camel coat. I feel like it breaks up the look, again, without being too drastic. I also think a trench coat would look great with this outfit but as it is cold in the UK, I went for a proper coat instead. The heeled black boots give me a little bit of height as well as providing some warmth to my ankles (as it goes quite high up on the ankle). I really like the look with these boots but I also think to dress the outfit down you can pair the trousers with trainers - maybe some Vans or Converse. Likewise, to dress the outfit up you can pair it with some heels. Also, loafers can smarten up the look instantly! I would say that I am pretty good with saving money and only spending where needed, especially when it comes to beauty. As a blogger of many areas including beauty, it is sometimes really easy to get influenced into purchasing a bunch of things you don't really need. When a blogger that I trust mentions that they are loving a particular makeup item or skincare product, I must admit that I am automatically thinking about buying it. However, I have some willpower in me to prevent me from doing so if it is completely unnecessary (which it is most of the time!). I have a few tips on how to save money on beauty and you can easily apply it to how much control you personally want. 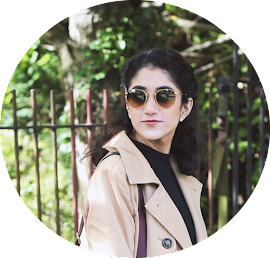 If you would like to know my advice for budgeting on beauty, please do keep reading! When shopping for beauty products, only buy what you actually need. Whilst walking around the store and picking up items, think to yourself 'do I need this or do I just want it' and if the answer is that you just want it... put it back down. Don't get sucked into buying products because you've heard rave reviews, it's on offer or if there is free delivery. Only buy what you need! Say if you want to buy a few new products because you want to treat yourself or you want to try something different, do so in moderation. Make sure you have a budget in mind of how much you can afford to spend / are willing to spend and bare that in mind when shopping. If you feel like you are overwhelmed with the amount of products in your beauty stash and you want to use products up... go on a beauty buying ban. I do this occasionally as it encourages me to only use the products from my collection and 'shop my stash'. You can set the ban to whatever timescale you like. I would usually do 2-3 months and if I run out of a necessity or something I don't have a back up of, I only allow myself to buy the replacement. I know I said earlier on to not get sucked into buying something because it's on offer but if you do want to spend money and still budget on beauty, take advantage of discount codes and offers. Keep an eye out for codes on websites that will knock a certain percentage of the total price. Even search the Internet for some because that is sometimes rather helpful! Also, if you have signed up to newsletters / regular emails from your favourite beauty brands and stores, keep track of offers and discounts available through the emails they send. And last but by no means least, be a smart shopper. Think about it... you can't just put everything you see and like in your basket and just buy it. Make decisions on what you need, what you don't have already or even what you have run out of. Just be wary of what you are buying and shop in moderation. Personally, I prefer shopping from highstreet brands as I don't like spending much on beauty at all. And because this works for me, I continue to do it. So, try trawling through the more inexpensive stores and brands if you are looking to save some money. There are some great dupes and alternatives out there! Do you have any budgeting tips?